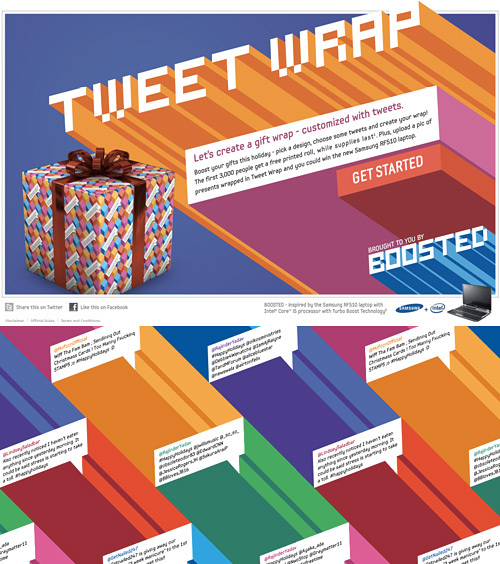 More Geeky Wrapping Paper – Samsung's Tweetwrap | OhGizmo! By Andrew Liszewski on 12/13/10 • Leave a comment! As part of a promotion for their new RF510 “boosted” notebook, Samsung will let you buy a roll of custom wrapping paper featuring a holiday-appropriate pattern of your choice adorned with tweets pulled from either a specific hashtag or username. Well originally they gave out 3,000 rolls for free, but that ship has already long sailed. Now a 19×76-inch roll of the custom wrap is $6.95 which isn’t that expensive actually. Arguably it’s not as cool as the QRapping Paper we brought you last week, but it’s the perfect choice if your giftee is a Twitter fanatic.